Janis Terpenny talks about the Center for e-Design and Iowa State’s role in the Digital Manufacturing and Design Innovation Institute. 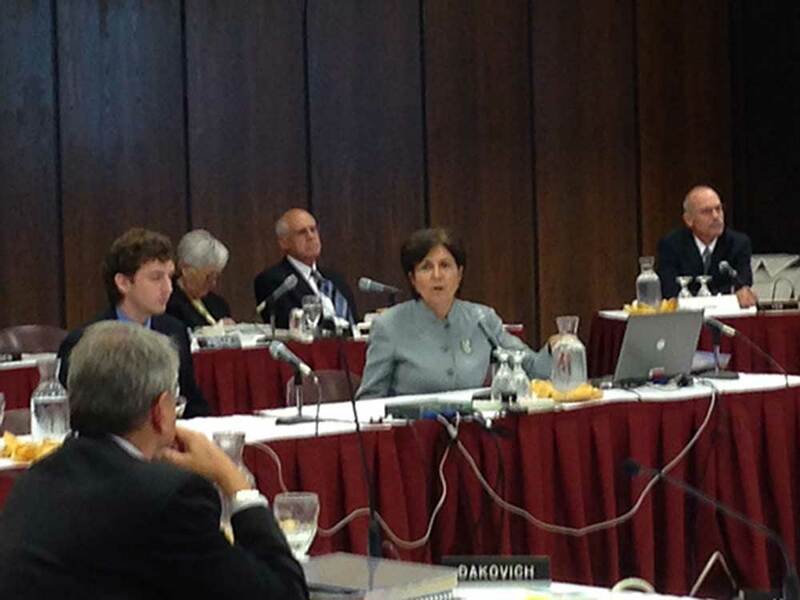 On September 10, 2014, IMSE Chair and Joseph Walkup Professor Janis Terpenny provided the Board of Regents with an overview of some important research that’s taking place at Iowa State’s campus. Janis Terpenny presents at the Board of Regents. One topic included the Center for e-Design, which Terpenny co-founded and currently directs. She discussed the center’s goals to bring high-quality products to market at reduced costs and times through developing research, strategies, and tools, as well as to nurture and cultivate a new generation of engineers, scientists, and business leaders. Terpenny also presented about the Digital Manufacturing and Design Innovation Institute, where she is a technical lead in the Advanced Manufacturing Enterprise area. The institute is a collaborative center designed to foster innovation and commercialize research between industry and engineering schools. Connor Jennings, a graduate student in industrial and manufacturing systems engineering, also presented at the Board of Regents meeting.